Aaron, Becky, Christopher, and Chris got on their boots to talk about U2’s 2009 album No Line on the Horizon. How does it hold up? What about the 360 tour? Are we still going crazy if we don’t go crazy tonight? Listen and find out! Matt and Chris run down the top events from 2018 as far as U2 is concerned: from Tulsa to Berlin and (almost) everything in between. It's Not Over, They Didn't Play 40! Sherry, Chris, and Caroline are on the show to talk U2’s tour stops in Dublin as well as the final Experience + Innocence show in Berlin. Jill, Matt, and Chris talk about U2’s changes to their E+I setlist for Europe. It’s a musical journey and we’re celebrating the 30th anniversary of that journey U2 took on Rattle and Hum - the movie and the album. Matt, Collin, and Chris are your guides for this discussion of U2’s trip into the heartland of America. Aaron, Kenny, and Chris preview the upcoming European start of the Experience + Innocence tour. Eric, Marylinn, Matt, and Chris convene to talk about the final songs of U2’s albums - which ones we loved, which we hated, and which ones we thought could’ve worked better elsewhere. Lots of fun listener comments on this topic as well. Sherry, Collin, Mason, and Chris recap U2’s North American leg of Experience + Innocence, Sherry beach house show with Bono and Edge, and other U2 happenings in June. Chris reviews U2’s 2 show stop in Montreal, Tassoula covers U2 at The Apollo, and Matt tries to get a word in between. Caroline van Oosten de Boer joins Chris to talk about where she got started with U2 and she also helps Chris answer a bunch of questions about U2’s current tour and more. We talk U2’s #U2eiTour stop in Chicago, Bono and Edge on Ellen, and your questions about set lists, Joshua Tree 2017 tour video, Pop remasters, and where to go for drinks in Nashville. On this episode Chris gets Tassoula & Matt to open up about their experience at U2’s eXPERIENCE + iNNOCENCE. Also - we get some help from the livestream audience on what’s going on with that One video. A Bad U2 Fan Would Not Want to Hear That - SPOILERS! SPOILERS AHEAD! Matt, Mason, Collin, and Chris are talking about U2’s Experience and Innocence tour that’s starting in 7 days and we’re talking spoilers all over the place. We’re back and talking about all that we left behind over the last 3 months since we last recorded. Chris Endrinal joins Chris to talk about the musical theory behind 4 songs from Songs of Experience - Red Flag Day, Little Things, American Soul, and You’re the Best Thing About Me. Join Tassoula, Matt, and Chris as we countdown the year that was for U2. From the Joshua Tree tour announcement up to the Live at the BBC concert, we cover the highlights of 2017 for U2. Sherry, Ian, and a bit of Chris are back discussing Songs of Experience. Conspiracy theories, lyric dissections, and a whole lot more. Tassoula, OMG Chris, Collin, and Chris break down Songs of Experience song by song and get into all the love and hate we could handle of U2’s latest. Ian, Matt, and Chris get together for a quick chat to review Songs of Experience having heard the album a few times. Songs of Experience Eve - How Are You Going to Listen to the New U2 Album? Matt and Chris talk about the various ways people listen to a new U2 album when it’s first released. We’re joined by special guest Big Wave from the Zootopia forum to answer some of the most frequently asked questions about U2’s Experience and Innocence Tour pre-sale and general ticket sales. Tassoula, Sherry, Matt, and Chris are here to chat about Experience and Innocence Tour ticketing issues as well as Songs of Experience songs we’ve heard so far. Matt and Chris are joined by Sherry, Tassoula, and Mason who call in to give their thoughts on the recently wrapped up Joshua Tree Tour 2017. The Blackout is over and we’re back to talk about “You’re The Best Thing About Me” with Matt, Sherry, Collin, and Chris. The U2 machine is rumbling again! Not only is the Joshua Tree Tour 2017 about to resume, but U2 fans are getting strange letters promoting a new song and it looks like an album announcement could be coming soon. Sherry, Becky, Mason and Matt talk about all that, and answer your #askatu2 questions, in our latest podcast. B-Side: Why'd U2 Shoot Two Live Performance Videos? Matt, Ian and Sherry are back to discuss the rumors surrounding Songs of Experience and the two videos the band recently filmed. Kelly, Beth, Ian, and Chris go all the way back to Larry’s first U2 logo on a shirt and talk through the U2’s history of design. What we love, what we hate, and the little things that we notice along the way. We’re back for another discussion of The Joshua Tree 2017 Tour with Aaron, Sherry, Sienna, and Chris. We’re also joined by Bigwave from the U2.com moderator crew to help answer questions from listeners. Matt, Mason, Tim, and Chris convene to discuss our thoughts on U2’s first 6 shows of The Joshua Tree 2017 tour. Tassoula, Sherry, Becky, Jill, and Michelle are on the special atU2 Periscope couch after the opening night of The Joshua Tree Tour in Vancouver to debrief their thoughts on the start of this incredible tour. Matt, Tassoula, Sherry, and Chris chat about yesterday’s rehearsals for The Joshua Tree as well as today’s fan club announcement. Matt, Becky, and Chris take a few minutes to chat about the leaked photos and videos of what seems to be U2’s Joshua Tree tour stage. Is Passengers an actual U2 album? Is it rain or jiffy pop at the start of that song? New atU2 staffers Collin and Eric join Ian, Steve, and Chris to finally discuss Passengers in our album by album series. Tassoula, Sherry, and Chris chat about U2’s Red Hill Mining Town’s re-release in 2017 for Record Store Day. Aaron, Tassoula, Chris, and the newest atU2 staffer Sienna have a quick chat reviewing U2’s Facebook Live Q&A held today on The Joshua Tree’s 30th anniversary. 10 minutes on Adam Clayton’s picture with a blurry setlist that we Bunderdict Cumbertooth our way through. After his recent interviews with Edge, Adam Clayton, and Willie Williams we snagged Andy Greene from Rolling Stone for a conversation to get his thoughts on U2’s Joshua Tree Tour, what songs they’ll play, the promotional method for a unique tour like this, and fun stories about interviewing the band over his career. Get on your boots - Liseth, Sherry, and Aaron join Chris to talk about No Line on the Horizon, U2’s 12th album that came out in 2009. Jill, Ian, Becky, and Chris take a musical journey through How to Dismantle an Atomic Bomb - U2’s 2004 album that helped keep the band on the top of the biggest band in the world fight. For our first b-side we convene a panel of folks to chat about The Joshua Tree Tour announcement — ticket pricing, availability, and whether Drunk Chicken will make an appearance! All that you fashion and all that you make can turn into a 90m discussion of All That You Can’t Leave Behind. Ian, Sherry, Tassoula, Marylinn, and Chris spend a little while chatting about the ups and downs of U2’s 2000 album. A man builds a podcast, with guests and commentary. A man records a conversation so he can hear himself up close. Marylinn, Sherry, Ian, and Chris are talking Zooropa until the day begins at midnight so grab the nearest lemon and don’t go wandering too far. It’s time for our musical journey - a look back at Rattle & Hum, U2’s 6th album. Kenny, Sherry, Aaron, and Chris are back to talk through the album as well as recap the fun had at both #U240 parties. Becky, Kenny, Matt, and Chris are talking The Joshua Tree - U2’s biggest selling album to date. Join us as we trip through your wires, with or without you, until we still haven’t found what we’re looking for as we exit onto one tree hill. From #U240 in Cleveland at the Rock Hall we recorded a live conversation with Dave Fanning about his history with U2 - stories of hearing new albums in Bono’s house, his thoughts on the Apple album release deal, Bob Dylan, The Beatles, social media, floppy disks, Bono’s charity work, Paul McGuinness’ influence, and his thoughts on new U2 music. Thanks to the Rock & Roll Hall of Fame crew for recording this episode for us and putting on a great weekend in Cleveland to help celebrate U2’s 40th. Marylinn, Tassoula, Matt, and Chris are back discussing U2’s 1984 album The Unforgettable Fire. New producers on the record and a new location to record make for an interesting change from War — listen along in the dark with headphones on. Tassoula, Becky, Marylinn, and Chris continue our album by album discussion with War, U2’s third album, and some (on this podcast) would claim as their best. Spoiler warning! Bono isn’t the one singing on Seconds! As part of our U240 celebrations, we’re going to talk through each of U2’s albums. U2’s second album October is the focus of this episode. Tim, Matt, Sherry, and Chris talk about how and when to introduce your family to U2, what to do if your family doesn’t like U2 (Chris learned it’s not ok to kick them out of the house), and advice for taking kids to U2 concerts. Aaron, Sherry, and Chris answer #askatU2 questions and talk about the Paris concert video announcement, and The Edge’s interview on Off Camera. Jill joins us to talk about getting to meet Bono in NYC, Tassoula tells us about how she gets to so many U2 shows, Matt gets thunderstruck, and Chris is still trying to convince U2 to come to Saskatchewan. Kenny, Aaron (Ivan), Sherry, and Chris talk through the next batch of survey results from the 2016 atU2 Fan Survey. Ross and Brian join Matt and Chris to talk about what goes into putting together the Tours side of atU2 and include a few snippets of arguments over what constitutes a snippet. Matt and Chris are joined by Beth and Chris from the U2 Tattoo Project to talk about the atU2 2016 Fan Survey and give an update on their project. We recorded it live on Blab so there’s a video version as well if you prefer to watch. In honour of Adam Clayton’s birthday earlier this week, we decided to devote the entire episode to the man who holds the band’s rhythm in his hands - Mr. Adam Clayton. Where in the world is Larry Mullen Jr.? While you’re thinking about that, be sure to fill out the 6th Worldwide U2 Fan Survey. Sherry, Matt, and Chris talk answer your #AskAtU2 questions and talk about the responses to the survey thus far. It’s time to wrap up 2015 and so we’ve got Sherry, Aaron G, Matt, and Chris on to talk about what they each thought was the top U2 related moments of 2015. We’re joined once again by Mark Baker aka U2Brothr to chat about getting summoned back to Paris by U2 and what the full experience was like. We answer your #AskAtU2 questions and give our review of the HBO broadcast along the way. We recorded live from Dublin with Sherry, Steve, Liseth, and even a jet lagged Matt made an appearance. We talk about the first couple of Dublin shows and what people are looking forward to hearing, how the stage feels in the 3Arena, and what Irish fans are thinking of U2 this time. We’re joined by special guest Mark Baker, aka U2Brothr, to talk about his documentary, his experiences getting on stage with U2, and what it was like to be a part of a contest on U2.com to go to Paris only to find out he wouldn’t be going after all. We also played Name that Tune with Mark - as a bass player in a U2 tribute band you’d think he’d do pretty good, right? And we also talk a bit about the upcoming shows in Dublin, Ireland. 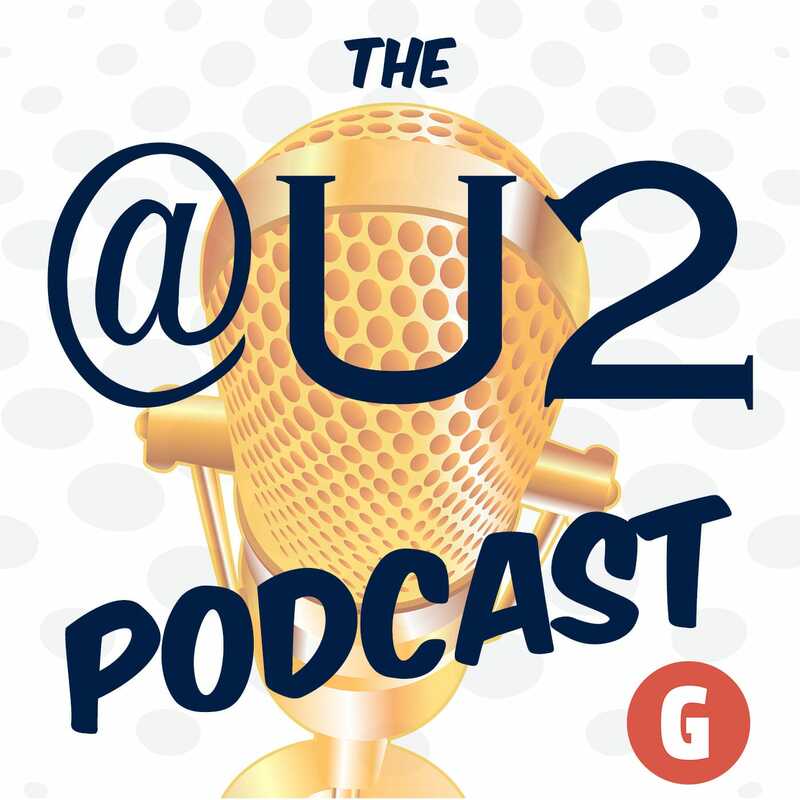 Sherry and Chris chat about what’s going on in the world of U2 this week including catching up with Aaron Govern who was at all 6 shows in London and has a great story to tell of extra experiences at one of the shows. 20 Years And This Is All We Get? It’s the 20th anniversary of the launch of atu2.com and we’ve got Answer Guy, Sherry, Tassoula, Matt, and Chris here to reminisce about it. We broke this up into 2 parts we had so much fun. Jill, Becky, Sherry, and Chris are on this week to chat about #askatU2 questions, the Global Citizen festival and we definitely don’t talk about whether U2 is selling out. Sherry, Matt and Chris are back to chat about Bono new blog, answer a bunch of #askatu2 questions, the rescheduled concert in Sweden, and what to look forward to in Berlin. Also: Happy Birthday to Matt! Sherry, Tim, Matt and Chris talk about their experiences trying to get tickets for U2’s upcoming Ireland tour dates, the recent concerts in Amsterdam, and answer a bunch of #askatU2 questions and try their best to #stumpm2 as well. Matt, Sherry, and Chris share their thoughts on the European launch of the tour as well as suggestions for fans looking to get tickets for the Irish dates on the tour. We answer your #askatu2 questions and a new segment arrives: #stumpm2. Sherry, OMG, Tim and Chris check the #askatu2 inbox and answer your questions and for the roundtable this time and talk Song for Someone video, rehearsal leaks from Turin and their thoughts on what the tour opener song will be in Europe. We talk about the upcoming European leg of the tour with guests Navid and Aaron and we open our Inbox and answer your #askatU2 questions including a special new segment with Matt. Beth and Chris join Matt and Chris to talk about their experience seeing 15 shows on the first leg of the U2ie tour. We also answer a bunch of #askatu2 questions and also cover the MSG scalper ticket story. We’re talking about the atU2 party for one more episode along with your #askatu2 questions and a roundtable discussion about the last few shows in New York. Tassoula, Tim, Matt and Chris debrief the 20th Anniversary Party for atu2.com. We also answer a bunch of #askatU2 questions submitted by listeners of the podcast. Matt, Brian, Sherry and Chris answer listener feedback and questions, debate the best seats to buy for this tour, and chat about where this tour ranks compared to previous tours. We’re a Podcast from the Internet. This is Our First Episode. We Hope You Like It. Hosts Matt McGee and Chris Enns introduce the what, where, why and how of the official podcast of atu2.com.